For those born March 16, 1962. You're one of the first people who's never lived in a world without human spaceflight. In April 2011, The Atlantic editors collected essays about human spaceflight on the 50th anniversary of Yuri Gagarin's historic trip. You were born in March of 1962. This year, The Atlantic celebrates its 160th birthday, making it 3 times as old as you. The year you were born, Robert Moses, the controversial and influential city planner who shaped the development of New York City, defended his vision for the American city. Around the time you were born, in a landmark decision, the U.S. Supreme Court found that federal courts could rule on redistricting cases. In December 2016, Garrett Epps wrote about the legacy of that decision, 54 years later. At 7 years old, you were alive to behold people walking on the moon. Cooley High was released in 1975. 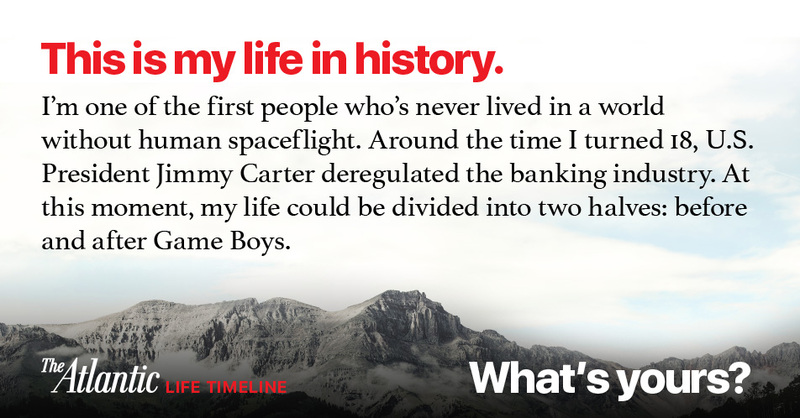 Around your 18th birthday, U.S. President Jimmy Carter deregulated the banking industry. In October 2016, Matt Stoller wrote about how deregulation like this became a staple of neoliberal policy after Watergate. Your life can be divided into two halves: before and after Game Boys. In April 2014, Eric Levenson looked back on the games that popularized handheld gaming. In 1991, Demi Moore, who was born the same year as you, earned a Golden Globe nomination for Ghost. In July 2015, Megan Garber wrote about the enduring popularity of one of the songs used in the movie, "Unchained Melody." When you turned 45, you watched humankind reach the outer solar system. By the time you turn 62, the World Bank predicts that the U.S. dollar will lose its global dominance.